Now that your fireplace is as unique as you are why not add that final little piece. With this 19 inch Hargrove gas wood basket your fireplace will definitely give the statement of uniqueness. 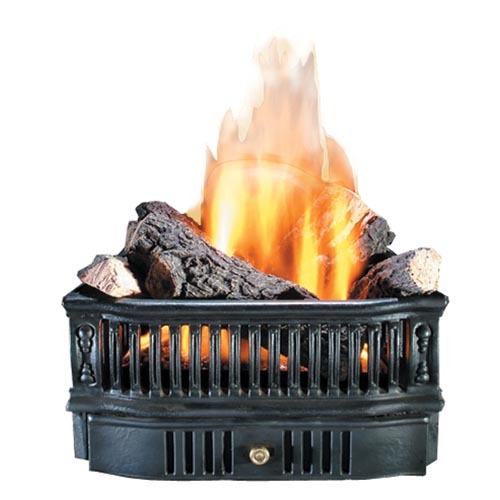 This Hargrove 19'' gas wood basket with manual safety pilot is made of a black cast iron with a two-tier burner system the natural wood burning of the 5 refractory logs keeps the authentic look you are longing to create in a fireplace. This Hargrove wood basket uses liquid propane. fabulous real flame. Gives that warm cozy feeling I was looking for. Well made-- very heavy castings that should last forever.